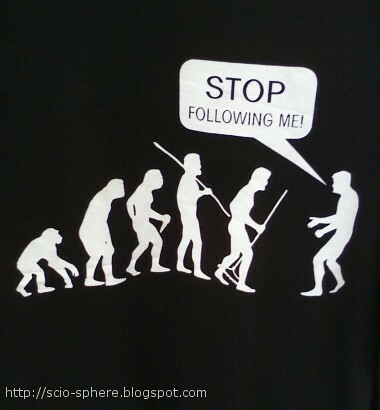 Saw this T-shirt in a mall and loved it. Pity they didn't have my size. 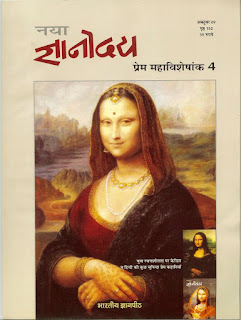 I saw this magazine cover and was impressed by the artists rendering of an 'Indian' Mona Lisa. Note the Indian-style jewellery on the neck, wrists, hands, ears, nose and upper forehead. The garments display the rich design work favoured by Indian women. The make up is restrained to original Leonardo da Vinci, but with the touch of bindi, in the centre of the forehead. In the two insets in the main portrait is, first the original work, and below another alternate rendering of an Indian Mona Lisa - in perhaps Mughal-style garb and the whole painting being in Indian classical style. My parents are getting their wardrobes fixed. In a tropical country, wood is rarely a long lasting building material. 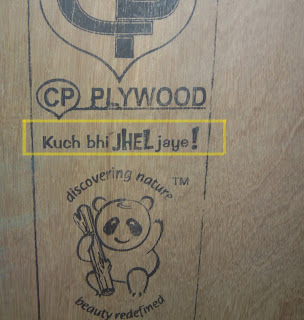 My Mum & I had a good laugh when we noticed the product byline on the plywood boards being used ..
'Kuch bhi Jhel Jaye' or कुछ भी झेल जाये, translated into simple english would be 'can deal with anything'. There's a lot lost in translation there. Hindi, as it has spread over the huge number of communities in the India, had acquired distinct flavours across social strata. The 'street'-Hindi slang definitely, a more colourful cousin of the traditional respectful formalised Hindi, is gaining traction in the media and in people's conversation. The 'in-your-face' language uses cynicism and black-humour phrases to express the difficulties faced by rich, dense, low-resourced, and slow moving masses. It is an outlet of emotions, that many subscribe to. Therefore it is this language that now ad agencies use to form by-lines to their products, and connect to their target audience. Coming back to our phrase, the verb 'Jhel', can be more accurately describe as 'to deal with or tolerate - without actually wanting to be in that situation in the first place'. Such as to forced to listen to somebody going on-and-on without stopping, would be a good example of 'Jhel'. In this case the plywood advertisers want to convey that their wood can deal and tolerate anything, be they termites, humidity or any other foe. By using 'Jhel' it becomes a humourous encounter. This has been building up for some time. 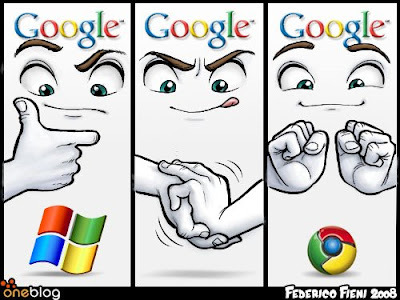 Google army of talented devleopers has been gradually pushing into areas of desktop computer applications. Google has Office suite - Google Docs, Browser - Chrome, Email - Gmail and I can keep going. In fact, I find that most of my computing requirements can now be covered by some form of Google service. As a software developer, I find that many of the online platforms and components are also being rethought and launched from Google. Now to support all this from your desktop/laptop is the first explicitly declared Google Operating System for personal computing (they already had Android OS for mobiles) - Google Chrome OS. .. So today, we're announcing a new project that's a natural extension of Google Chrome — the Google Chrome Operating System. It's our attempt to re-think what operating systems should be. Yet it is much too early to count Microsoft out. It recently launched Bing, a new search service, which has taken some market share from Google. In October, roughly when Google will make Chrome OS available, Microsoft will release the next iteration of its operating system, Windows 7, a version of which is supposed to run well on netbooks. And the firm is spending billions on a “cloud”, a global network of huge data centres, which will rival Google’s infrastructure and allow Microsoft to offer all kinds of web-based applications. Will there be a clear winner? Probably not in the foreseeable future. The pockets of both firms are simply too deep. And that is a good thing: the epic fight between the two giants promises to speed up innovation. And that is what the IT industry needs to overcome the recession. Here's another interesting Firefox extension to navigate the plethora of tabs we open up in our browsers these days. It seems to offer the best visual special effect options in executing the transition between different tabs. A combined thumbnail view also allows the user to see what is in each of the tabs. A good thing is that by default it opens up inside your browser and doesn't take over your whole screen. That is, unless you want it to. Hmm ... come to think about, ideally the best and most useful tab navigator is one that navigates the brower tabs and the open applications in one interface. It would require combining the browser system with the computer operating system with some stylized transitions. Let's see if anybody comes up with that one. Another day to remember. An august gathering hosted by the High Commissioner of India for the visiting Indian cricket team in New Zealand. A pleasant dusk evening enhanced the outdoor setting. The Indian cricket team has been visiting New Zealand again after a gap of over 5 years, and the changes have been significant. Led by a dynamic new captain, the team has found its confidence and has been performing phenomenally. In 2003-04 a tired Indian cricket team had been more or less steam-rolled in New Zealand. Not this time. It is the 'Black Caps' who are struggling to form a response. The New Zealand media has been labelling this tour as a visit from 'Rockstars of Cricket', acknowledging the enormous following and gravitational pull of the Indian cricket scene. Having met the Indian team in 2003-04 and now, the change in demeanour and body language is clear. The players seemed happier, more willing to mingle with others, less tired and clearly confident. Its always amazing how young some of these guys are. TV certainly makes them look 10 years older. Here are some photos from the gathering. The gathering, Bowling coach Venkatesh Prasad can be seen in the centre. With Yuvraj Singh, one of the best international all-rounders and 20-20 star. With Sachin Tendulkar, international cricket icon. As part of the DRM (Digital Rights Management) and Copyright regime's push worldwide for compliance, a law is being proposed to be passed in New Zealand. Section 92a, that amends the country's copyright law is expected to come into force on February 28. What has drawn near-universal criticism, is the provision that Internet Service Providers (ISPs) are to terminate the connection of anyone labelled a 'repeat infringer' of copyright violations. So just 'repeated accusations' are required, without further proof. Certainly a deviation of normal justice. The lack of response of the government to the criticism is drawing increasing ire. 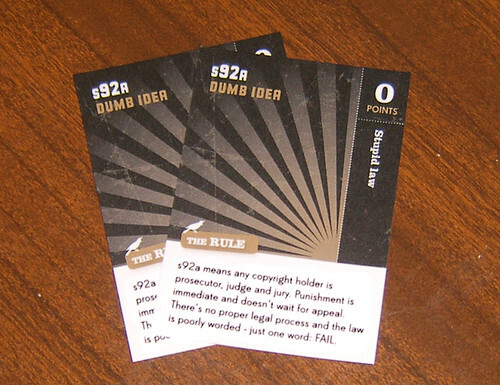 At the Webstock conference, one of the game trading cards is used to highlight this. At creativenewzealand.org a protest NZ Internet blackout has been called. Hence you see my profile photo blacked out on most of social websites. Another potential side-effect is it adds another reason to the creative IT community in NZ to leave for other shores. News article on parliament protest. This is the conference I look forward to every year. A huge amount of thought and energy by come of the most creative people in New Zealand web community goes in organizing this event. Sponsored by a plethora of companies and institutions such as Google. A typical attribute of the gathering is the rather forward looking and upbeat atmosphere which is easy to catch. This year we have speakers include people from Apple Inc., Google, and Flickr. The forum provides a good community where they can share their insights and battle-stories and the audience understand, sympathize and learn from these. They've finally induced me into starting a twitter micro-blogging account. I'll be putting live twitter updates when I can here, and will add further Scio-sphere blogs for some of the sessions later.